4.The Red Lake / Baia Rosie. 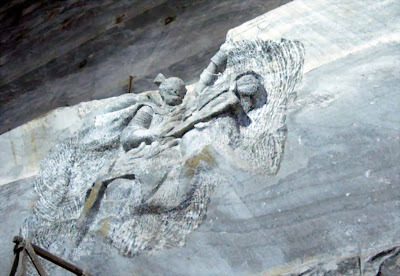 5.The Salt Mountain / Muntele de Sare - unique in the world, unfortunately partially collapsed due to weather erosion. 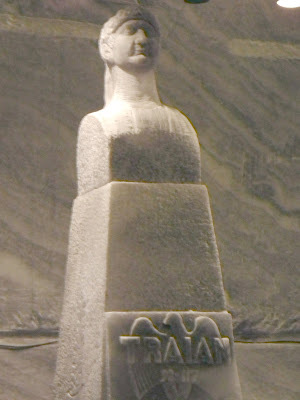 "The work for the opening of the Unirea salt mine started in 1938 and the exploitation of the salt from this mine was performed between 1943-1970. The exploitation was done downward from the ceiling to the basis in successive slices of 2.2 meters with a horizontal cutting at the basis and vertically along the walls. The de-rocking was made through shooting. 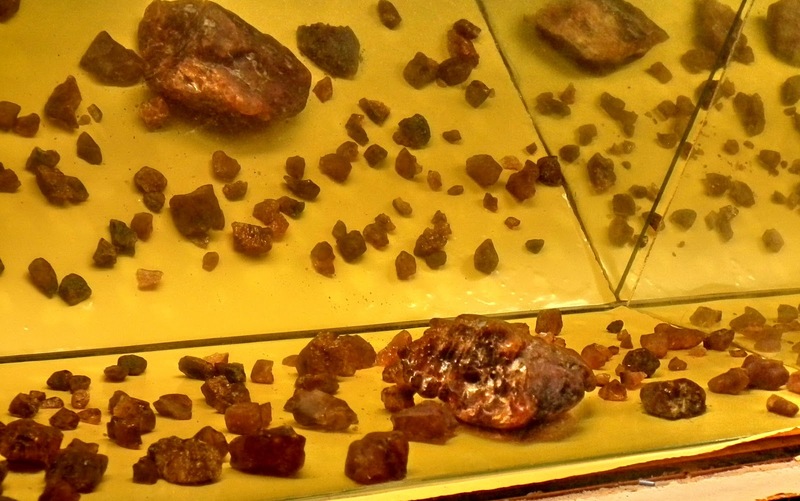 The transportation of the resulting material was effected with the tubs up the shaft using a cage to the installation of preparation and expedition. 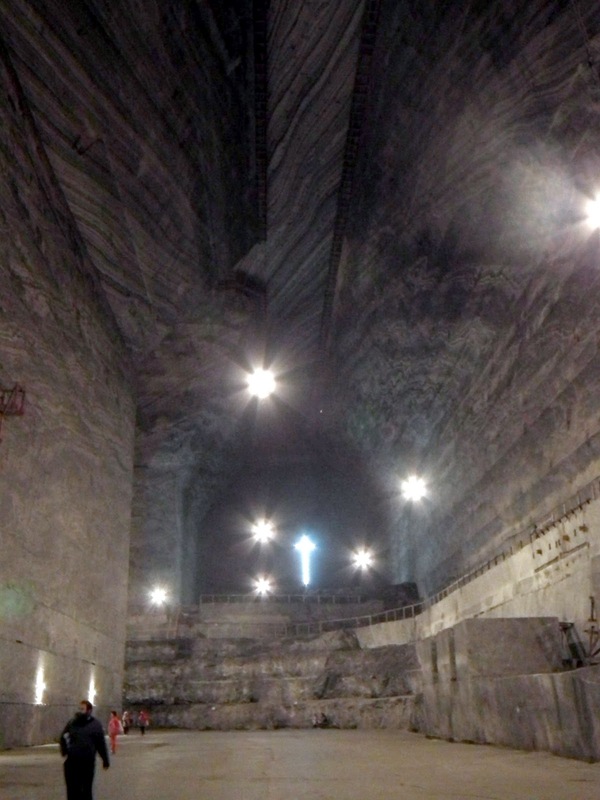 The mine comprises 14 chambers with trapezoidal profiles, having a 10 m opening to the ceiling and 32 m to the ground, a height of 54 m. The shore difference between the surface and the base of the mine is of 208 m and it is covered by the elevator in 90 seconds. 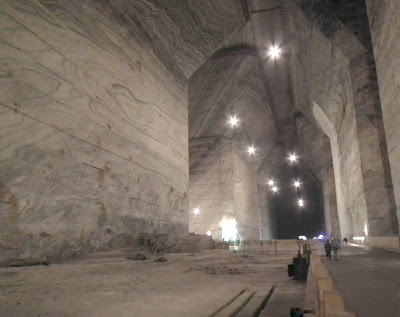 The excavated space occupies a volume of 2.9 millions m³ and it is extended on a surface of 7,8HA (78,000 m²). 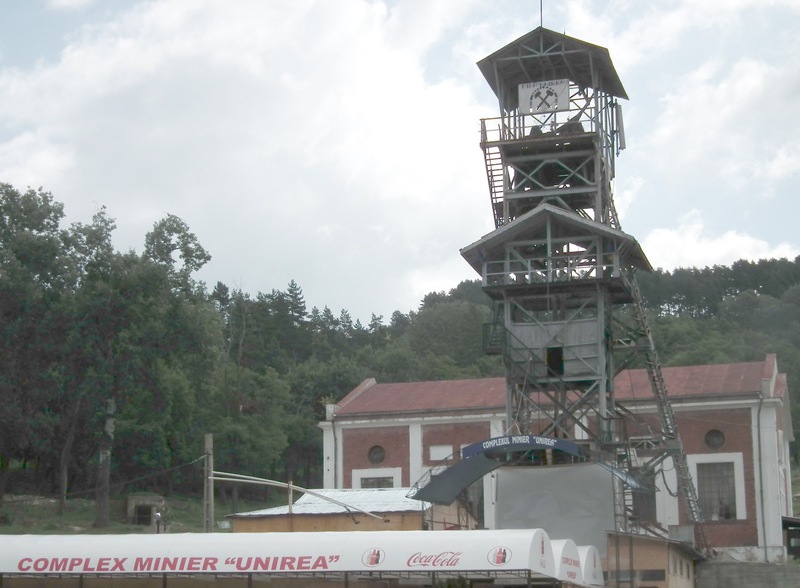 After 1970, the mine becomes a touristic objective, offering exceptional natural conditions as a result of its microclimate rich in aerosols, which proved its wellknown efficiency in treating the respiratory diseases. The air-conditioning of the mine is natural, with a constant temperature during the whole year of 12 °C, an atmospheric pressure of 730 mmHg and its humidity with an average of 10% lower than the surface average. The ceiling of the mine is bordered on the whole surface by wooden balconies that allow the circulation of the authorized personnel during the periodical controlling of the stability of the surfaces from the superior zone of the mine construction. 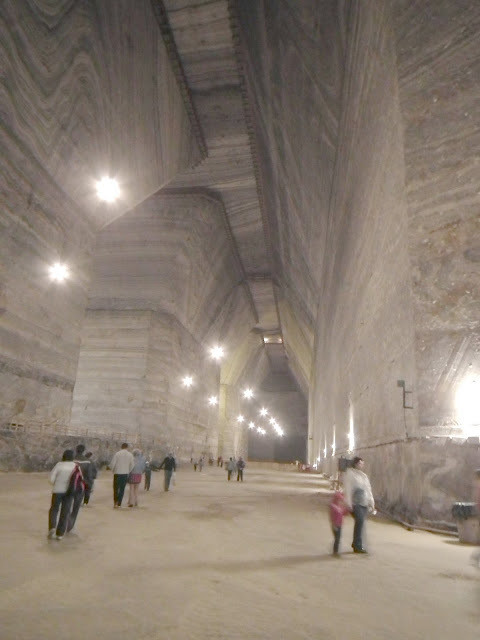 The zones with uncertain stability are delimited at the base of the mine, being forbidden the access of the visitors." 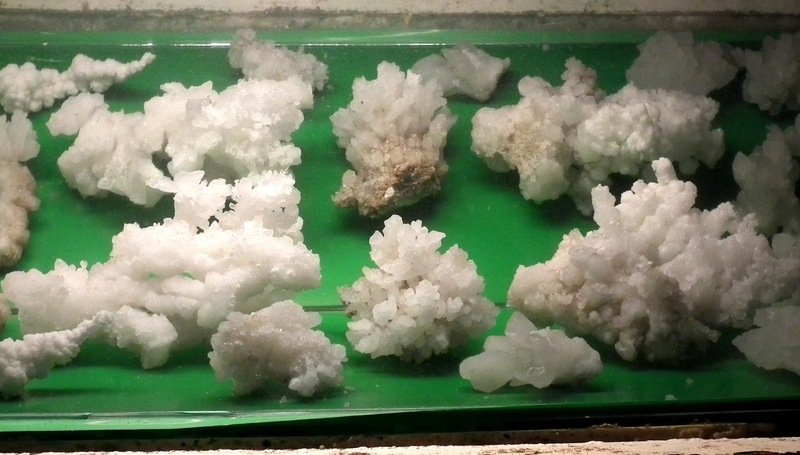 There are also some other exploitation salt mines in area: The Green Valley/ Valea Verde, The Sheperd's Lake/ Baia Baciului, Carol, Mihai and The Victory/ Victoria. The Mihai Mine was the first electrical illuminated mine from Romania. 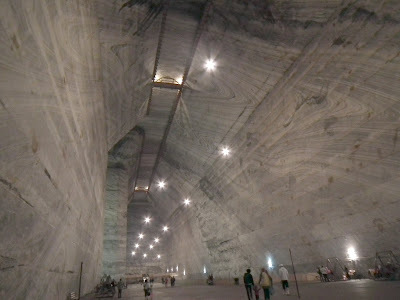 It is located above the Unirea Mine and separated by a 40m thick salt floor. It had just 6 rooms but due to its larger dimensions(66m high, 37m at base and 12m at ceiling) was used between 1970 and 1994 to host of several aero-modelling contests (I had the chance to visit it during one of these events and it is less impressive than Unirea Mine). I was really upset in 1994, when Unirea Mine and Mihai Mine were affected by salt dissolution under pluvial waters. 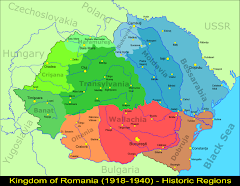 Of course, it marks another point on my Why I love Romania / De ce iubesc Romania list, and although it took several years until the mine was reopened to visitors, there are still visible water infiltrations on the walls and large amounts of water has been accumulated in 2 pretty large lakes. 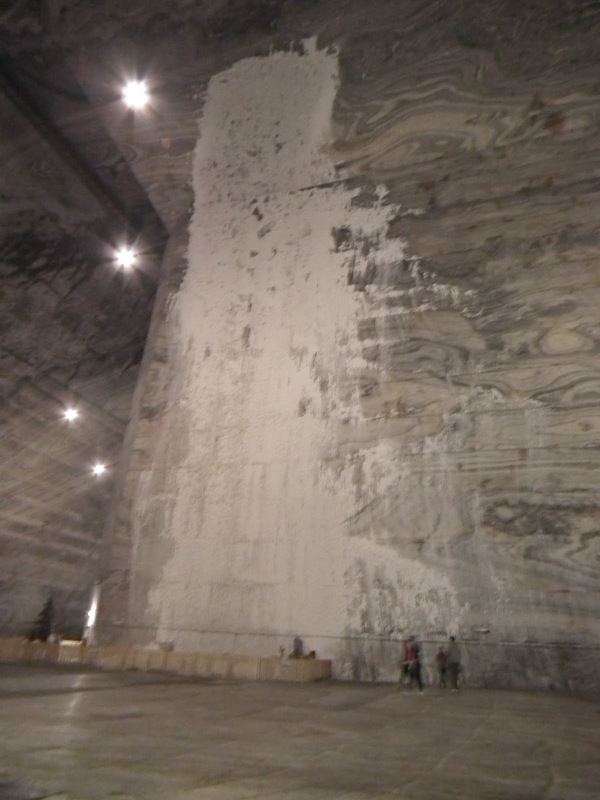 My father was captivated by the magic of the scenery inside the salt-mountains at his first visit there and we used to spend many hours (almost every summer) in the mine, just as tourists, playing various games on the playing grounds ( football, tennis court, volleyball, table-games room), walking/ running along the halls or admiring the natural design of the salt stratification done by infiltrations and the artworks carved or painted in salt by various artists. 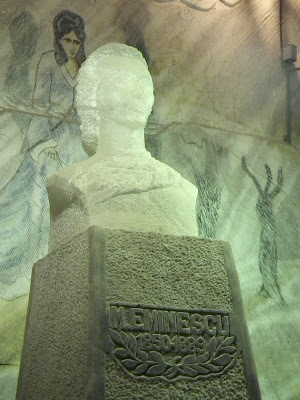 nor the Mihai Viteazul base-relief and Eminescu's bust - carved in salt rough out by Oana Brezeanu, another local artist. 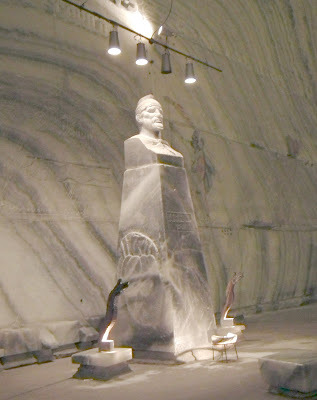 It is amazing also to see that various paintings on salt have no damages by humidity (around 50%) and saline microclimate with air-composition rich in sodium-ions. and Gem Salt (natural sodic chloride crystallizes in cubical system diversely coloured because of the inclusions) / Sare Gema (clorura de sodiu naturala care cristalizeaza in sistem cubic si este divers colorata datorita incluziunilor). 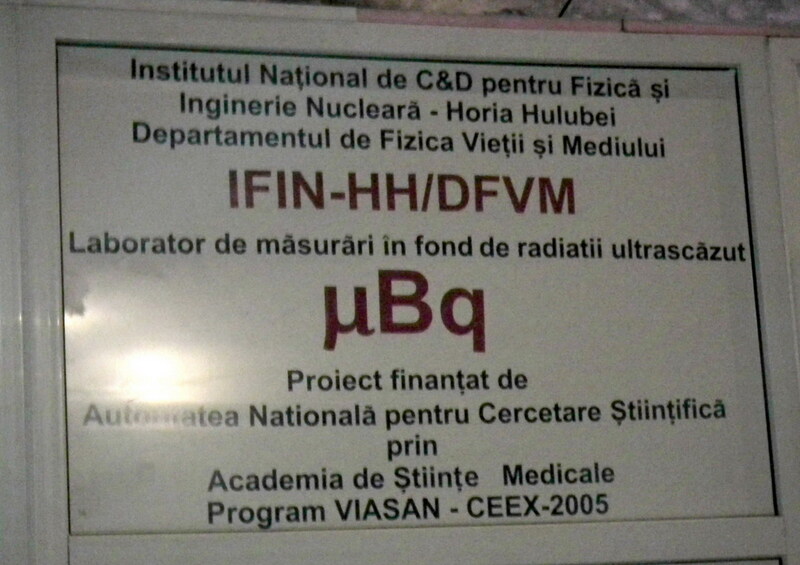 One of the rooms is hosting an Ultra-low Background Radiation µBq Laboratory / Laborator de Masurari in Fond de Radiatii Ultrascazut of Horia Hulubei National Institute of Physics and Nuclear Engineering - IFIN HH/ Institutul National de Cercetare si Documentare pentru Fizica si Inginerie Nucleara Horia Hulubei - an institute dedicated to the research and development in physical and natural sciences. 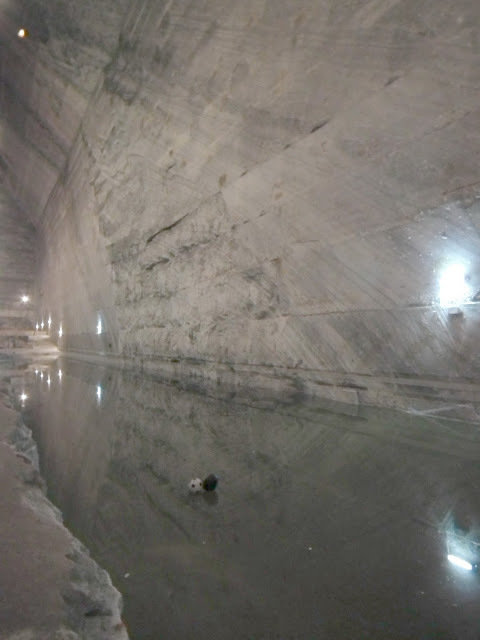 I will be more than happy if one day I'll see, underground and in the surrounding area of the Old Salt Mine, eventually online (unfortunately I did not find any official website of it), more improvements, into a similar process with the restoration of Turda Salt Mine, based on local funds, funds according with The Romanian's Ministry of Regional Development and Tourism campaigns / Ministerul Dezvoltării Regionale şi Turismului and EU funding non-reimbursable grants for tourism. Unirea Salt Mine/ Mina Unirea deserves to improve its image and to stand for the most impressive and the largest Natural SPA PARK in Europe.